Oops, Holiday weekend and I'm late once again with the post to collect the posts for the SeedGROW project. Add your link to the comments here or tweet it to me and I'll collect them. CheeseHead Gardening > Happy labor Day and a Seed GROW Update for September. Garden Faerie > Everything's Coming Up Marigolds. Participants, drop the link for your seedGROW posts in the comments of this post or tweet them with the #SeedGROW hashtag on Twitter so I can add them. Yes, I'm as surprised as you that it is August and time for another update. How are your lettuce, basil and marigolds fairing this month? http://cheeseheadgarden.blogspot.com: Seed GROW Project August Update. http://gardenmom29.blogspot.com: Everything's Coming up Marigolds. http://www.growingthehomegarden.com: August Grow Project Update. http://mrimomma.blogspot.com: SeedGROW Project Post #3.
http://novagardener.wordpress.com/ : C'est la vie. http://reneesgardenseeds.blogspot.com: August Update: Pesto Pizza Homecoming. "I'm growing with the SeedGROW project. Thanks to Reenes Garden for the seeds." Sorry about the late posting. This is the second month of the Seed GROW project for 2011. It being a holiday weekend some postings may be a little late. Feel free to drop your link into the comments of this post. http://jennsgardeningspot.blogspot.com : Marigolds are not in my future. http://cheeseheadgarden.blogspot.com: Seed GROW Project July update. http://www.myrubberboots.com: I'm Loving Renee's Garden Babies Butterhead Lettuce. http://gardenmom29.blogspot.com: Things are Growing Along Nicely. http://www.growingthehomegarden.com: July GROW Project Update. http://mrimomma.blogspot.com: GROW Project 2011: Post 2.
http://myskinnygarden.com : Squirrels Love My Washtub and Marigolds. 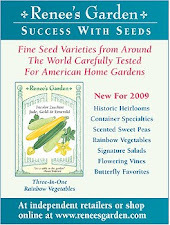 http://reneesgardenseeds.blogspot.com: Seed GROW Project Update. The SeedGROW project is back for the 2011 growing season. This year the selection of gardeners trialing seeds provided by Renee's Garden is smaller than the first year due to time constraints. A couple months ago I posted the signup offer on Twitter & Facebook with a short window to reply and participate in the grow along. Here are the bloggers who joined the project this year. http://jennsgardeningspot.blogspot.com :> A Container Garden Journey. http://www.myrubberboots.com:> 2011 SeedGROW Project Kicks-Off Today. http://mrbrownthumb.blogspot.com:> Seed Starting Bio-Dome From Plastic Bin. http://myskinnygarden.com :> Using Washtubs for Container Gardening. This year we'll be joined by Nellie who works at Renee's Garden who will be growing the seed along with the garden bloggers. Our first posts about growing Basil "Cameo," Lettuce "Garden Babies" and marigold "Yellow Splash" will publish on June 2nd. Subsequent post will occur on the 2nd of every month. My apologies to those who wanted to sign up this year but didn't get a chance. I'm short on time this year and couldn't cast as wide a net as I did last year. I'll update this post with links to this month's post as they come in. Sorry for the delay in creating the post for the SeedGROW roundup. This is the final SeedGROW post for the season and I want to thank everyone for their participation. I hope to do something similar next season. If you continue to have reason for post (blooms, recipes, ideas) past this month into winter I'll be happy to create a post and link to this. I hope you enjoyed the project and got to meet some new garden bloggers and discovered a plant that you will grow for years to come. If you're late (raises hand) with your post feel free to drop a link to your post in the comments. Also, look over the past months and if I somehow missed your previous post please let me know, I want to make sure to get all of them archived. Miller Time: SeedGROW October Update. Garden Faerie's Musings: The Scenic Route. The Indoor Garden_er: Seed GROW Project #7 DOA. My Skinny Garden: Plant Nasturtiums Facing North. My Northern Garden: Deep Orange Nasturtiums for Fall. Brown Thumb Mama: Seed GROW Project Location Lesson. The Write Gardener: Lazy Blogger. True Epicure: It's a Trap! Growing In Chicago: Watch out for those Nasturtiums. The Garden of Live Flowers: October Nasturtiums That's a Wrap! Mini Garden Guru: SeedGROW Project #6-It Keeps Growing. Cheesehead Gardening: Seed GROW Project October Update. Garden Mom 29: The Nasties Escape the Freezer. Yard is Green: Aint Nobody Happy if Nasty's Aren't Happy. The Running Garlic: Garden Wrap-up. Our Little Acre: 'Spitfire' Nasturtiums Are Still Going Strong. Jenn's Cooking Garden: October is the end for the Nasturtium GROW Project. If you have ideas for next year I'm open to suggestions. Sorry for the delay in making this post. September, the second to last month of the seed GROW project is here. Since this is a holiday weekend if you are late with your monthly post just post it in the comments. MillerTime~ SeedGROW Project September Update. Mahlzeit~ Still spitting fire in September. The Home Garden~My Nasturtiums are Invisible. Evolution of a Gardener~ September Nasturtiums. The Write Gardener~ Nasturtiums grew Best in bad Dirt. Cheesehead Gardening~ Seed GROW Project September Update. Jenn's Cooking Garden~ Super-sized Nasturtiums for September. Our Little Acre~ Seed GROW Project-September. My Northern Garden~'Spitfires' Hanging in There. The Running Garlic~ Tough Summer for Gardening. KTown Homestead~ Second Coming of Nasturtiums. Yard is Green~ Seed GROW Project "Spitfire" Nasturtiums. Indoor Garden_er~ Seed GROW Project Late Version. The Garden of Live Flowers~ Nasties on the Rebound. Mini Garden Guru~ SeedGROW Project#5-The Takeover Has Begun. Time for another seed GROW update. If you were late with July's post feel free to leave it in the comments of the July post and I'll update the page with your link. Also, there's a PR agency in Chicago looking for reviewers of cleaning product for outdoor garden furniture. If you're interested in participating sign up here. The Write Gardener~ Spitting Fire. Personal Garden Coach~ Renee's Garden 'Spitfire' Nasturtium Update. Garden Faerie's Musings~ Mish-Mash Seed GROW. The Garden of Live Flowers~ August: At least the leaves are pretty. Garden Girl~ Ho Hum Nasties. Cheesehead Gardening~ Seed GROW Project August Update. Happy Hobby Habit~ Grow Project, Post 6. Miller Time~ August SeedGROW Project Update. Garden Mom~ Nastiness in August. True Epicure~ Not an Epithet. The Home Garden~ Nasturtiums and an Arbor. Indoor Garden(er)~ Seed GROW Project #5: Fun Nasturtiums Recipes. My Rubber Boots~ I've Got NEW 'Spitfire' Nasturtiums: Seed GROW Project. K-Town Homestead~ They break your heart every time. In the Garden Online~ One Word: Pathetic. Get in the Garden~ Seed Grow Project 3. Our Little Acre~ A Nasturtium Grows in Ohio. Jenn's Gardening Spot~ Nasturtiums and some hidden surprises.